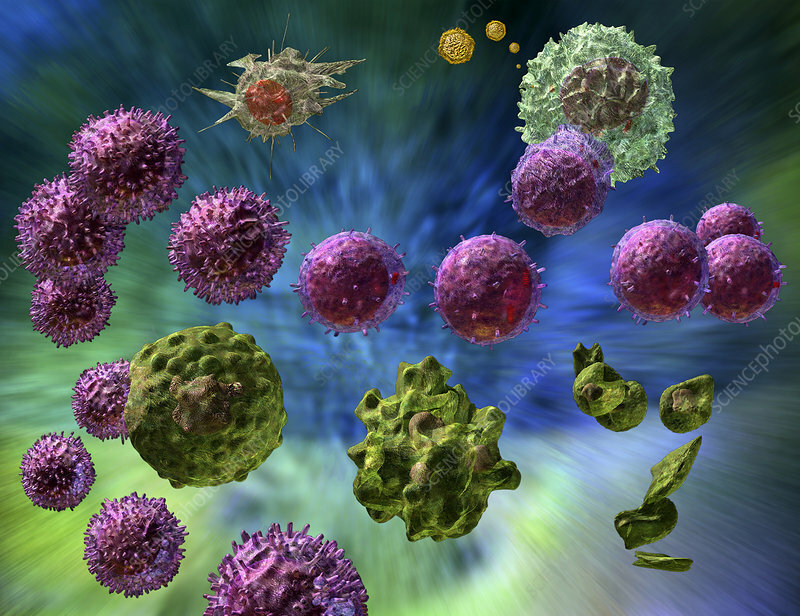 Cell-mediated immune response, computer artwork. This type of immune response is most often used against intracellular pathogens, such as viruses. The viruses (gold) are phagocytosed (engulfed) by macrophage cells (green), a type of white blood cell. Fragments of viral protein (antigen) are displayed on the macrophage's surface. The antigen is recognised by a helper T lymphocyte (purple, centre and right), which secretes chemicals to activate other immune cells, including cytotoxic T lymphocytes (purple, left). The cytotoxic cells release chemicals that cause the macrophages to disintegrate and die, killing the viruses inside as well.